Complement your landscape design by adding landscape lighting as a finishing touch. We, at O’Grady’s Landscape, understand how important landscape lighting is to the overall look and feel of your property. Not only does it extend the use of your landscape so you can enjoy your property in the early mornings or late evenings, but it also improves safety in your property and will accentuate all the beauty your gorgeous landscape has to offer. Whether you’re building a new landscape or just want to update your existing space with enhanced lighting systems, our qualified staff is here to help. 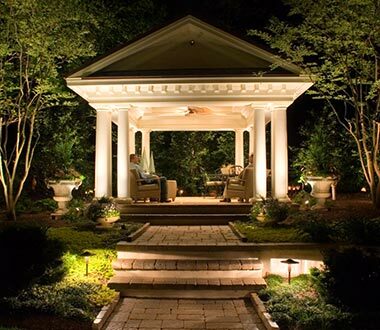 We have the experience and extensive product selection to bring your landscape design to life with outdoor lighting systems in Herndon, Virginia. At O’Grady’s Landscape, we can help create the perfect outdoor lighting design to bring out the beauty of your home’s outdoor living space and views. We can design lighting specific to your plantings, hardscapes, patio, walkways, and specialty accents like statues and elements! We will create an outdoor lighting design that will not only add curb appeal but functionality as well. Once the sun goes down, does your home disappear in the dark? Highlight your home with specialized accent lighting! Outdoor lighting around the home will highlight your home’s curb appeal as well as add additional safety by lighting up your home at night. If you are looking for lighting you can forget about, ask us about automatic timers with photocell control. This feature helps monitor sunlight so they’ll automatically turn on at dusk and off at dawn. No work for you, just let us set up your system and enjoy! If you are concerned about outdoor lighting increasing your electric bills, consider low voltage lights. This set of landscape lighting is popular because they use less energy and tend to be less expensive than regular lighting systems. If you are energy conscious, this set of lighting is definitely one to consider. We can tell you all about it! Are you looking for an extra dimension in your front lawn? We can install uplighting near the base of your trees to give your front lawn a glowing, yet dramatic effect. 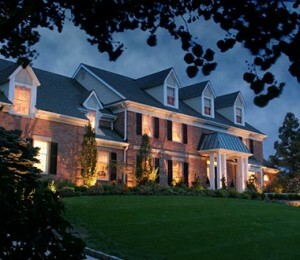 Interested in another type of landscape lighting service? Need help coming up with unique outdoor lighting designs? Whether you’re looking for eco-friendly lighting products or want to use specific lighting techniques, like uplighting, we’ve got all your needs covered and more! During your personalized consultation, one of our experienced landscape designers will guide you through the selection and design process to help you come up with creative ideas and expertly implement them for you to bring out the best in your landscape design. Our team is excited to meet with you. 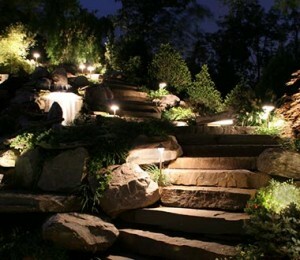 At O’Grady’s Landscape, we use CAST lighting systems for our landscape designs. CAST systems are considered the finest products in the market and are known to offer durable beauty and reliability. They’re low maintenance too! Whether you’re building a new landscape or just want to update your existing space with enhanced lighting systems, we can help. We have the experience and extensive product selection to bring your landscape design to life with outdoor lighting in Herndon, VA. Call us at 703-533-5001 to schedule a consultation today! You will be pleased you contacted us! Our team is always here for you!